“The spiritual master clears all obstacles from our spiritual path just like one uses a plough for that purpose. 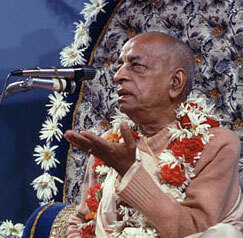 And the spiritual master is considered to be the representative of Sri Balaramaji.” – Radhanath Swami. When the first child was born, Vasudev brought the child to Kamsa, “Here, he is yours.” Kamsa said, “You are such an honest person. I have nothing to fear from this child. It’s the eighth.” When Vasudev was walking away with the child… he already had experience of Kamsa: one minute he was so nice to Devaki and in the second he was ready to kill her. He was thinking, “You can’t trust anybody who doesn’t control their mind and senses. He may be saying nice things now; however, you don’t know what he’ll do tomorrow.” And sure enough, due to evil association, then very shortly after that, he (Kamsa) killed the child and imprisoned Vasudeva and Devaki. And in that prison, six children were born consecutively, and each one Kamsa would brutally, cold bloodedly, murder right before their eyes. Vasudeva had several wives, two of which were Devaki and Rohini. Now at the time when Kamsa was persecuting Vasudeva and Devaki and put them in prison, Vasudeva entrusted his other wife Rohini to live in the cowherd village of his dearmost friend Nanda Maharaja. So she was living in Gokula along with Nanda and Yashoda and under the protection of the Vrajavasis she was living a very very happy life. So this child was transferred to her womb. And it was on the full moon night of the month of Shravana that this beautiful child was born, Sri Balaramaji. In shanta-rasa, it is Balaramaji who expands himself through his energy to create Goloka Vrindavana. The spiritual world of Goloka is the expansion of the energy of Balarama, the land and all of the surroundings simply offering the most sweet and loving service to the Lord. Balarama also expands himself through his energy as Krishna’s crown, as Krishna’s flute, as Krishna’s slippers, as Krishna’s clothes, as all of Krishna’s ornaments. It is all Balarama himself just appearing in these most wonderful forms just to give pleasure and service to Sri Krishna and to assist him in attracting the hearts of all living beings in beautiful decorated forms. Krishna is all attractive. The supreme pleasure of Lord Krishna’s flute is to attract everyone’s heart. So when Balarama appears as the most beautiful crown, the most beautiful flute, the most beautiful jewels, the most beautiful lightning golden colored dhoti, he assists Krishna by decorating his body in such a way that his attraction becomes more attractive to attract the hearts of all. So this is how Balaramaji appears in the shanta-rasa. As far as dasya-rasa, whatever Balarama does is in the mood of the menial servant simply trying to please Sri Krishna, his brother. In Sakhya-rasa he appears as Krishna’s friend. They wrestle together, they play together, they dance together, they herd the cows together, they argue together and they fight together. Why? All in the mood of just giving pleasure to Krishna, just to supply service to the Lord. And because Balaramaji is Krishna’s elder brother, he also has vatsalya-rasa relationship because as elder brother sometimes he takes that position- “Krishna, its late, go home”, “it’s time to wake up.” “Krishna, Gopala, today is your birthday, you can’t go out and play, you must stay home.” Sometimes in the forest when there was danger he would be very protective like a parent to Lord Sri Krishna because that is the way an elder brother is supposed to be. And in madhurya-rasa conjugal love, Balarama can’t directly take part in that lila with Krishna, because it’s embarrassing when Krishna is dancing with gopis for the elder brother to be there who is kind of like a parent. Balarama doesn’t want to create an uncomfortable situation. So he expands himself as Ananga-manjari. How clever Balaramaji is! Because Radha and Krishna, their relationship is the same as the peak, the ultimate end of loving reciprocation in madhurya-rasa, and because so many secrete rendezvous between Radha and Krishna take place, Radharani is very much afraid Balarama. And out of great respect Balarama is very much afraid of Radharani, because he knows what her relationship is with Krishna. So they more or less have their separate lilas in so many ways. But still Balarama wants to assist the love affairs of Radha and Krishna. So he appears as Ananga-manjari who happens to be Radharani’s younger sister, and he lives in the same house as her. And he is actually the most intimate confidential sister, associate of Radharani, and he is constantly playing with Radharani and making all wonderful arrangements for her to meet with Krishna. So in this way Balarama, he provides service to Krishna in all the five primary rasas and he is purely unique in this manner. When we speak of Vishnu–tattva, Balarama’s presence is most important. It is described in the Bhagavata, in the Brahma Samhita, in the Chaitanya-charitamrita- “krishnas tu bhagavan svayam.” That Krishna is the original form of the absolute truth. “Govindam ädi-puruñaà tam ahaà bhajämi.” He is the ‘Adi-purusa’, the original person. Now when Krishna in the spiritual world, in Goloka Vrindavana, when he wants to enjoy transcendental lila, first he expands himself into a vaibhava-prakasha as Baladeva. Baladeva is the original servitor Godhead. He is Krishna himself appearing to serve Krishna. For the purpose of creation, Krishna, he first expands as Balarama. From Balarama is the expansion of Sankarshana, Aniruddha, Pradyumna and Vasudeva. From that Caturvyüha is the expansion of Narayana, the Lord of Vaikuntha. From that expansion is expanded the secondary Pradyumna, Aniruddha, Vasudeva and Sankarshana. From that Sankarshan is incarnated Adi-shankara who is the original Lord Shiva. Actually, systematically we can understand that – “vaishnavanam yatha shambhu,” that Shiva is the greatest, the supreme-most of all Vaishnavas. Why? 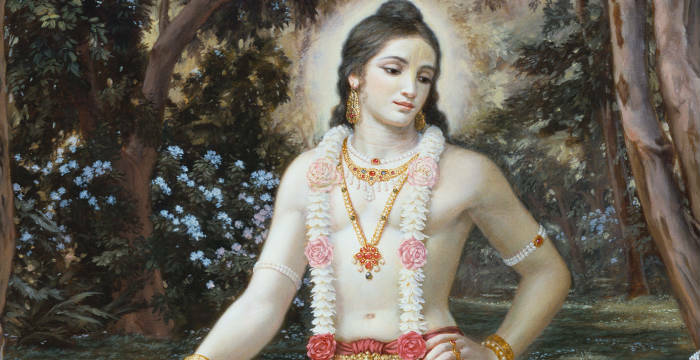 Because he is an expansion of the original spiritual master Balarama. Now that same Shankarshana also expands himself when it’s time for creation as Karanodakashayi Vishnu, Mahavishnu. From Mahavishnu the planets emanate from his body, the universes. He enters into each universe as Garbhodakashayi Vishnu and then he enters into the heart of every living being as Kshirodakashayi Vishnu. And all of the various incarnations that come in this world – Masyavatara, Varahavatara, Narasinghavatara, Vamanavatara, Ramavatara – they are all incarnations of that Kshirodakashayi Vishnu. So in this way we can understand that Balaram is the source of all incarnations. “In Goloka Vrindavana – we always see in pictures – Krishna always holds his flute and Balaramaji always holds plough. 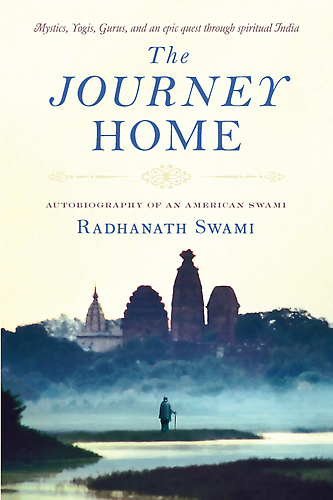 This is very significant also.” – Radhanath Swami. Why does Krishna carry his flute? To simply attract and charm the hearts of all living beings to his loving service. And why Balaramaji carries plough? What do we do with a plough? We clear the road. We prepare the field so that the seed will grow. We use the plough, either for that purpose, in agriculture, or even to make roads – to clear the obstacles. So as the original spiritual master, Balaramaji is personified with his plough for the purpose of… first of all the guru ploughs our hearts. His words are like plough to make our hearts nice and soft so that the seed of devotion can grow and be attracted to the sweet sound of Krishna’s flute. Now, we must understand that when the dirt of the ground is very dry, it has to be ploughed and that plowing, it’s not a very pleasurable thing for the earth; the ground is being ripped apart. Just being ripped and ripped and ripped. So this is the purpose of a guru, to rip our hearts apart until it becomes very soft to just plough it, plough it and plough it until all the hardness of the false ego and pride and illusion and lust and anger and greed… he has to make our hearts soft for the seed of love can grow in it. That’s what Balaram’s plough is for. Through his representative, the spiritual master, he softens and prepares the field of our heart for the seed of love to be attracted to the sweet flute of Sri Krishna. And as far as clearing the road, the spiritual master clears all obstacles from our spiritual path just like one uses a plough for that purpose. And the spiritual master is considered to be the representative of Sri Balaramaji.